Home CRAFTS LEGO Creator Has Made An Amazing Playable LEGO Grand Piano! LEGO Creator Has Made An Amazing Playable LEGO Grand Piano! 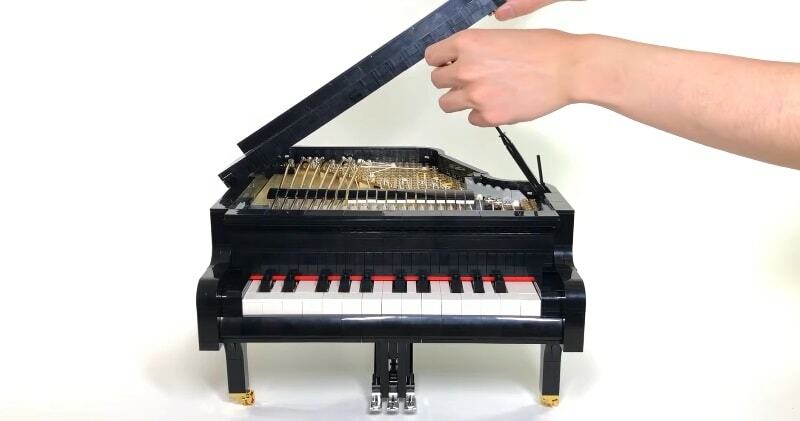 LEGO creator SleepyCow has made a Playable Lego model of a miniature grand piano with working parts.The design is finished with some elegant casing that looks right out of a Steinway workshop. The Concert Grand Piano, one of the most complex instruments of all time, is now in Lego form.Built entirely from 2798 authentic LEGO bricks, it accurately captures the mechanical details of a real piano. It impressively features working keys:Removable keyboard with 25 independent working keys, each key connects to its own hammer,Working damper and pedal function.25 strings.Realistic piano lid which can be open either half stick of full stick.Realistic fall board with a soft close. Removable music stand.Height adjustable piano bench.Self-playing function enabled by adding PowerFunction, which allows keys to play at different tempos and rhythms.Realistic piano wheels.